Jeff Zalaznick and his team at New York-based Major Food Group have brought their upscale all-day café and bakery concept Sadelle’s to Las Vegas with an emphasis on tableside theater. The second location of the café, known for serving towering platters of smoked salmon and other deli-inspired luxe brunch options, opened in December 2018 at the famed Bellagio Hotel and Resort’s Conservatory. In accordance with most Las Vegas-style restaurants, the new Sadelle’s — at 10,000-square feet — is even larger and more theatrical than its predecessor. Named after Zalaznick’s grandmother, Sadelle’s made its debut in New York City in fall 2015 with a menu of upscale iterations of smoked and cured fish, breakfast sandwiches and pastries — familiar territory for New Yorkers who take pride in their traditional Jewish delis and all-day breakfast spots. At the original Sadelle’s, bagel barkers bring freshly baked creations to every table, portions are large enough to share, and customers can enjoy all-day caviar service. At the newer Las Vegas location — the hospitality group’s 23rd restaurant overall — the hustle-bustle of the brand is turned up to eleven, thanks in part to the roomier interior of the Bellagio space, which allows for tableside Bloody Mary service and pastry carts that zoom from table to table, piled high with chocolate chip loaves, raspberry jelly doughnuts, and blueberry Danishes. Zalaznick said the Major Food Group restaurants are known for their carts. The group’s concepts include The Grill and The Pool, the high-profile dual reinventions of the beloved Four Seasons in New York, as well as The Lobster Club, Carbone and Parm. But he said there was never enough room at the New York Sadelle’s to include these interactive experiences. The Bloody Mary carts, for example, come loaded with ingredients for putting together three iterations of the popular brunch drink, including the classic, a green version made with tomatillo and jalapeño; and the “Ghost of Mary,” with ingredients that have been clarified until they’re nearly clear. Customers can also customize their toppings by adding olives, peppers and other garnishes from the roving carts, although Zalaznick said he did not go “too crazy” with the offerings — you won’t find fried chicken as a Bloody Mary garnish option. 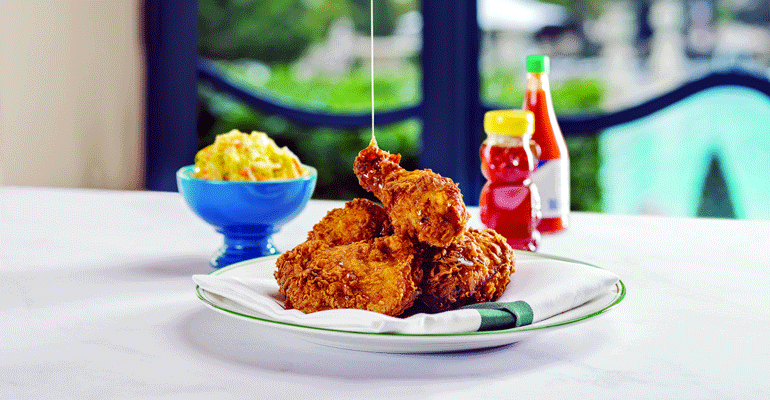 Other new additions to the Sadelle’s Las Vegas menu — which is 20 percent to 30 percent larger than its predecessor — include a New Orleans-style crispy chicken sandwich topped with coleslaw and Russian dressing; honey-mustard everything-spice chicken wings; and loaded fish tacos, as well as new iterations of Sadelle’s signature triple-decker sandwiches. Similar to the original Sadelle’s, the Las Vegas location is transformed at night: the Bloody Mary cart becomes a martini cart, and certain menu items like tuna tartare, spicy Asian noodles, and the fried-chicken sandwich are only available after the breakfast rush. Although Sadelle’s representatives did not return request for comment on the pricing of the new restaurant, smoked fish platters and bagels at the New York City location range in price from $15 to $24 and caviar service ranges from $100 to an astronomical $1,950. 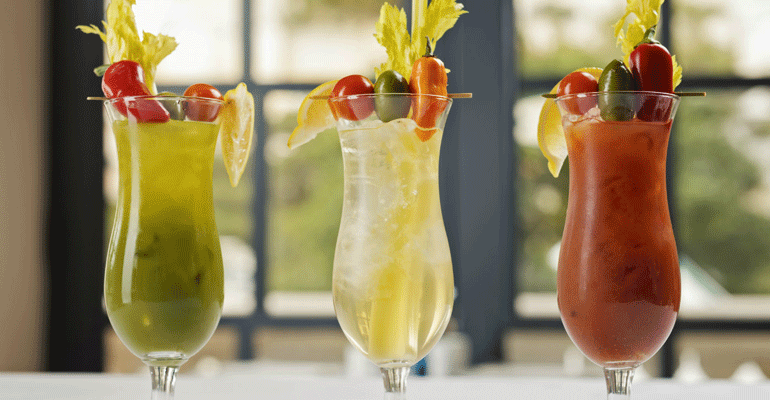 In addition to the roaming Bloody Mary and martini carts, the drink selections at Sadelle’s follow single flavor, fruit-forward profiles, Zalaznick said. The Coconut for instance, comes in a fresh young coconut that’s cracked to order and filled with rum, lime and a house-made cocktail mix. While the new Sadelle’s atmosphere feels familiar, Zalaznick emphasized that it’s important for them to “not carbon copy” their restaurants and that the restaurant’s interior — designed by Ken Fulk — is just as much inspired by the celebratory grandness of the Bellagio as it is by the Sadelle’s brand.